Walter Norman Haworth was born on March 19, 1883 in Chorley, Lancashire, England the second son and fourth child of Thomas and Hannah Haworth. His father was the manager of a linoleum plant. After attending the local school until the age 14 Haworth joined his father and learned about linoleum design and manufacture. His interest in chemistry began when he studied the dyes used to color linoleum. He continued his education studying under a tutor in the neighboring town of Preston, which allowed him to pass the entrance examination for the University of Manchester. Against his family's wishes he began at the University of Manchester, studying chemistry under W.H. Perkin. He graduated with first class honors in 1906. On the basis of his work under Perkin he was awarded a 1851 Exhibition Scholarship which allowed him to study in the laboratory of Otto Wallach in Gottingen, Germany earning his doctorate in one year of study. He returned to Manchester where in the minimum time possible he was awarded his D. Sc. for his work on terpenes. Terpenes are produced by plants and their building block are units of isoprene. In 1911 Haworth took an appointment as a demonstrator at the Imperial College of Science and Technology in London and in 1912 he was appointed a lecturer at the University of St. Andrews in Scotland. At St. Andrews he became interested in the chemistry of carbohydrates while working with Thomas Purdie and James Irvine. Haworth organized the laboratories at St. Andrews for the production of chemicals and drugs during the First World War. In 1920 he was called to take the chair of chemistry at the University of Durham. The following year he succeeded Philips Bedson as director. In 1925 Haworth was appointed professor and director of chemistry at the University of Birmingham where he remained until 1948. Then he became the dean of science and he served as an acting vice-principal from 1947 to 1948. Haworth's research centered around carbohydrates and he determined the structures of many, including maltose, cellobiose, lactose, gentiobiose, melibiose, gentianose, and raffinose. He was also responsible for discovering the glucoside ring structure of normal sugars. Normal sugars that are five or six carbons long form a ring structure where the terminal hydroxyl nucleophillically attacks the aldehyde carbon forming an glycosidic bond. He developed Haworth projections which are two dimensional representations of three dimensional sugar structures. Haworth was also the first person to chemically synthesize vitamin C, the first vitamin artificially synthesized. 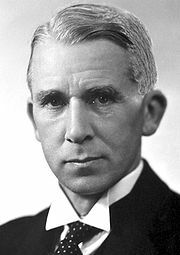 For his work understanding the structures of carbohydrates and the synthesis of vitamin C Haworth shared the 1935 Nobel Prize in Chemistry with Paul Karrer. In 1947 Haworth was knighted. In 1977 the Royal Mail issued a postage stamp honoring Haworth for his Nobel Prize and the synthesis of Vitamin C.
He died suddenly on his 67th birthday, March 19, 1950.